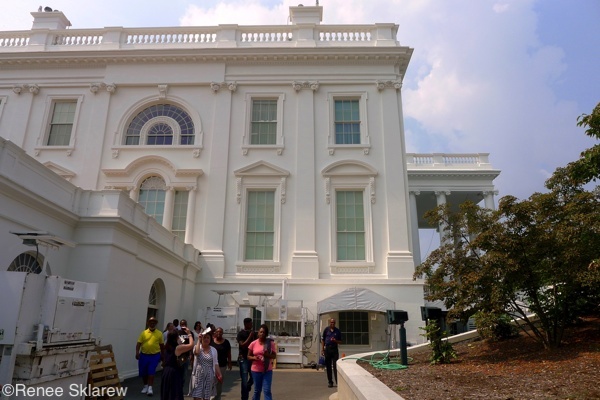 Today, join Renee Sklarew, coauthor of The Unofficial Guide to Washington D.C., as she takes us on a White House Tour. In this election year, don’t you wonder what it’s like to live in the White House? Clearly, there are many who do and have dreams of becoming the next occupant. 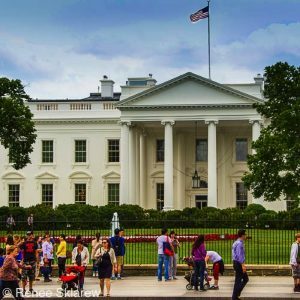 As I was working on a guidebook about Washington, D.C., I wanted to be able to explain the experience of the current White House tour so others would know what to expect. My first recommendation is to just reach out and write to your congressional representative. If you don’t exactly know who that is, go to this website and insert your zip code. Then you’ll see your representative, unless there’s more than one possible person, in which case you’ll need to insert your street address. When you first apply for a White House Tour, you can’t specify the date or time, but you can put in a window of time that you prefer. It’s really that easy! The next step is to find “Request a Tour” on the congressperson’s website. Fill out the request form for a tour of the US Capitol, Bureau of Engraving and Printing (where the government prints our money), Supreme Court, and a few others. Of course, you want to see the White House, so go to that link. On the site, there are detailed directions so you will know what is required; for example, you’ll need to provide your full name, date of birth, gender, social security number, and address. If you’re a foreign national, you’ll need to fill out the same information you would fill out when entering the United States. Next, you’ll receive an email from your representative. It designates the day, time, and location of your White House tour. On the day of your tour, you need to bring along your driver’s license or passport (if you’re bringing a child, he or she won’t need a driver’s license, of course). You’ll need to arrive 15 minutes early at the Hamilton Gate, which is on 15th Street. All visitors must pass through a security gate similar to the machines at the airport. Finally, you’ll be escorted to a big room with lovely photos of different presidents and their families. There’s a small gift shop where you can pick up a souvenir. The first rooms you’ll see are the Library and the Vermeil Room. The library was a laundry room in the days before President Franklin Roosevelt. It now has 2,700 books related to American life. It’s used when a president or first lady engages in an interview with a member of the media. The Vermeil room was once used for billiards but now contains paintings of several first ladies, including Jackie Kennedy and Lady Bird Johnson. It’s called vermeil for the extensive collection of gilded silver. The furnishings are soft pastel colors and, like in almost every other room, there is a fireplace. The tour guides are members of the Secret Service under the “Uniformed Division.” They share stories about each room and the history of the artwork, and they usher you along. You’ll see the movie room and the Presidential China Hutch, which displays the various china and silver patterns of the different administrations. You’ll walk upstairs to the expansive East Room. It’s kept empty, ready to serve a number of functions, such as a greeting space for dignitaries or a site for public events, like the signing of the Affordable Care Act or performances by famous musicians like Paul McCartney. In the past, it’s been used as a place to hang laundry and was the site of President Abraham Lincoln’s funeral. The group is ushered into another room called the Green Room, a lavish sitting room used to host teas and parlor events. Today, the dark mahogany furniture contrasts strikingly against the bright green Oriental rug, green velvet couches, and stunning crystal chandelier. The room is filled with portraits of American leaders and paintings by American artists. 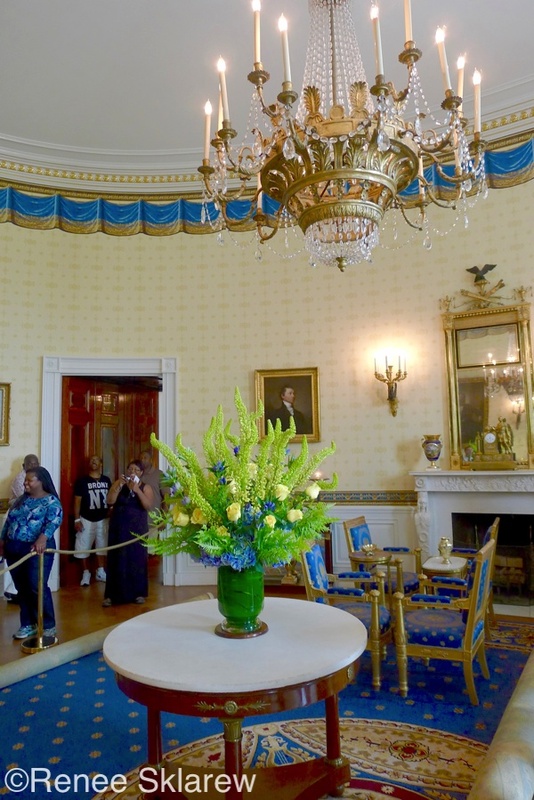 The next stop on the tour is the Blue Room, a very regal space shaped like an elliptical or circle, furnished in gold and blue by the original American hostess, Dolley Madison. It served as a drawing room and is used by the president and first lady to receive important guests. It was used in the wedding of President Grover Cleveland in 1886; during the Christmas holidays, it is the site for the principal Christmas tree. Eight pieces of furniture made for the room in 1814 were lost and then rediscovered at an antiques auction. 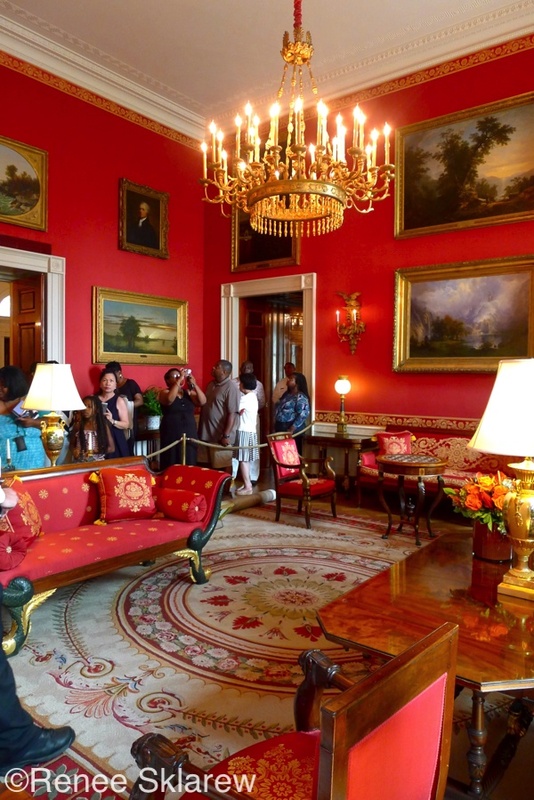 The Red Room is dark scarlet and is set aside for private meetings of presidents and first ladies. It was once called “the music room” for the pianoforte that was placed there. Theodore Roosevelt used it as a smoking room, and there are a number of impressive paintings within the space, including portraits of Alexander Hamilton, Dolley Madison, and Martin and Angelica Van Buren. 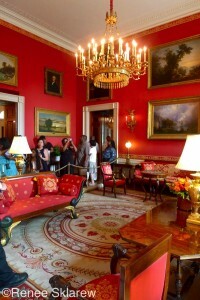 The largest room on the White House tour is the State Dining Room, with an expanse of white walls adorned only with one memorable portrait of Abraham Lincoln. Once owned by the Lincoln family, the portrait was donated with the understanding that it would be the only one in the room. There is also a very long dining table used for State Dinners. The rug is a lovely repeating pattern of flowers and leaves. Before leaving, visitors are invited to shoot a few selfies before heading out to the North Portico and Grand Foyer. The pianoforte was moved into this white room with pillars, high ceilings, marble flooring, and crystal chandeliers. You can see the banister to the stairwell and portraits of Presidents George W. Bush and Bill Clinton. This is your last glimpse before heading out the door, possibly thinking, “Wow, it isn’t that big or that fancy.” It sure isn’t like the palaces in Europe and luxurious hotels in North America, but maybe that’s what makes the White House so American. It’s an impressive, imposing structure from afar; however, up close, it’s very accessible and friendly.